Winter Solstice marks the shortest day of light and longest night of darkness in the year. After this time we gain more and more daylight and so is the perfect opportunity to celebrate. We celebrate not only the light that is about to come into our lives, the upcoming spring and summer, the rebirth of nature, our energy and lightness but to also acknowledge & honour the darkness in our lives, the inward reflection, the times of non-action, the death and letting go of that which no longer serves us and the gifts that our time of darkness has brought to us. In Ancient times in the Northern Hemisphere, this time was celebrated with the Yule Festival, which later was reformed into the celebration of Christmas. At Yule, a celebratory feast was had with animal sacrifices, of which would be eaten at the feast, and other rituals to praise the Gods for victory, wealth & a plentiful upcoming harvest as well as toasts made to those who had departed this life. Modern Yule celebrations are focused around the return of the Sun, meditating in the darkness, lighting candles and burning logs of wood. Also many of the Christmas rituals of decorating a tree, wreaths and feasts are also part of the ceremonies. Come join me and our Sisterhood in Celebrating this wonderful time. On the evening of Winter Solstice (in the Southern Hemisphere) Wednesday 21st June, we will gather together to feast. Our feast will begin at 6.00pm where we will connect with others and enjoy soups and stews, herbal teas and mulled wine. We will open our Winter Solstice Circle with Blessings sitting around an Elemental Mandala at 7.00pm and receiving gifts (Flower Wreaths and Sage sticks). We will also honour the Four Elements, Earth, Water, Fire & Air of our home, this planet, (as part of a beautiful central mandala) as well as acknowledging the Darkness that we are moving out of with a Gong Healing. 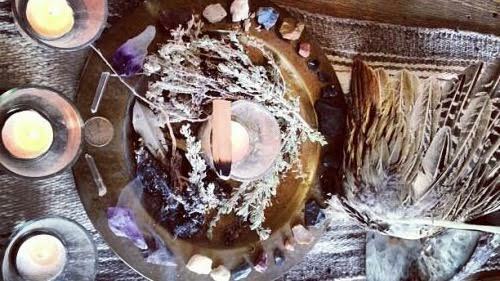 We will move into generating Sun energy with a collective Chant Meditation, create Solstice Wishes together and participate in a Ritual Offering where, each of the members of our Sisterhood, offer dried flowers and herbs to a bowl of bath salts with their Solstice Wishes. (At the end of the evening each of us will take away a cup of the collective offerings to continue our personal Winter Solstice bathing rituals). We will continue to build our collective Sun energy with a freeing, invigorating & celebratory Dance. Our Circle will close around 9.30pm with continued blessings and prayers for one another as we now step into more lightness. I excitedly invite you join us to celebrate this beautiful evening full of ceremony, release & celebration!! > wear something warm but feminine, flowing dresses over tights, with warm scaves & throws & warms socks, think winter goddess. and if you have any other questions whatsoever, please don't hesitate to contact me by emailing mish@meditationwithmish.com.